Jim Harbaugh is a great coach. He did wondrous things in the NFL with the San Francisco 49ers, and he’s done a great job guiding the Michigan Wolverines back to prominence. But if there is one thing that can be said about him, at least during his tenure at Michigan, it’s that he can’t seem to get the job done when it matters most. He can’t beat Michigan’s rivals. During his first season, the Wolverines lost to Michigan State and Ohio State. Last season his Wolverines managed to beat the Spartans but lost to the Buckeyes again. Saturday night they lost to Michigan State once again, 14-10. Overall, Harbaugh has earned an excellent record during his time at Michigan (24-7; 14-5 in conference). But to many fans, it stings that he can’t seem to beat the teams they want to beat most. Every game is important, of course, but there are some you want to win more than others. If a college team is going to just win a couple of games a season, most fans would be okay as long as those two wins are against their hated rivals. But Harbaugh can’t seem to do that. His failure to do so has given rise to a growing sentiment in the media and amongst fans. Harbaugh struggles to develop quarterbacks. As respected as he is, maybe—just maybe – he’s a little overrated. Brady Hoke’s record was not much different than Harbaugh’s 31 games into his tenure, and he was 2-2 against the team’s rivals. So, does this mean Michigan needs to start thinking about firing him if Michigan loses to Ohio State again? If so, they may want to start accepting resumes. Ohio State appears to have worked out many of its kinks. The Buckeyes are crushing opponents on both sides of the ball. A win over Michigan could be what the need to vault themselves back into playoff contention. 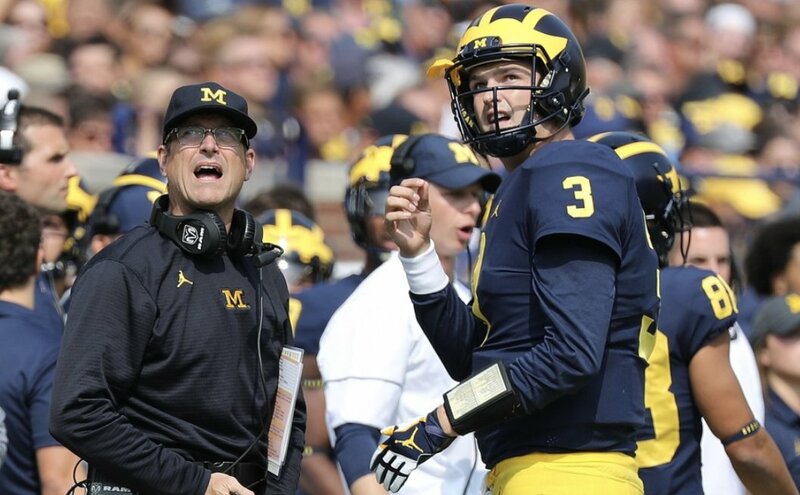 However, that task appears like it is going to be even tougher now that it appears Wilton Speight is out for the season. John O’Korn is a senior with a fair amount of experience. As far as backup quarterbacks go, they could certainly do worse. But, like any backup quarterback, he needs a little help to be successful. He needs an offensive line that will give him time to throw and a running game that will take some pressure off him. Saturday night against the Spartans, he got neither. O’Korn’s three interceptions in the second half can’t be blamed on the team’s poor running game or lack of protection. Michigan actually turned the ball over five times, but the Michigan State offense struggled so much throughout the game they were only able to take advantage of one turnover. After Michigan’s first fumble of the game, they marched 46 yards on six plays to take a 7-3 lead. As frustrating as the turnovers were, the Michigan defense did its job holding the Spartans to just 252 yards of offense. Michigan State quarterback Brian Lewerke was just 11 of 22 for 94 yards and a touchdown. The Spartans didn’t record a first down in the second half until their final drive of the game. When your defense plays that well, you must win the game. But Harbaugh’s offense can’t seem to get the job done. You can blame it on the weather and playing a second-string quarterback all you want, but Harbaugh was supposedly why Colin Kaepernick looked good his first couple seasons in San Francisco. So, what’s the problem at Michigan? A win over Ohio State at the end of the season will keep people from wanting to know the answer to that question. But should Harbaugh lose to a rival yet again…. Coaches have been let go for less.